Bright and very roomy, lots of natural light; great location, laundry facility, Could use a small sink with Microwave. The breakfast next door was absolutely fresh healthful. After breakfast the rest of the days' offering is blissful - Angelato is not be missed!! The tram stop with ticket vending is out front and parking is on site. Perfect spot!! everything was greaaaatt!!! it was the best apt we have been!!! will be using this place all the time for praha visit! It’s very nice ,big and clean apartment . It’s secure building and near to lots of different types of shops and restaurants. There is a closed tram station by just crossing the road which can transfer you easily to downtown or other sightseeing. Well equiped kitchen. Nice appartment. Good solution for late check in. The apartments are new, clean and comfortable, with all the ammenities one needs for the stay. 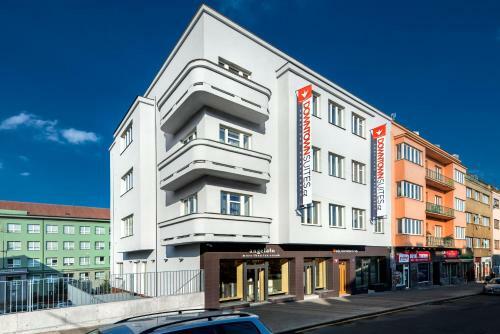 The location is very convenient as it is a 900 m walk to Hradčani and the tram that takes you to the city centre (number 22) stops in front of the building. The bed is comfortable and there is also a washing machine in the apartment. The bathroom is big and eqipped with soap and hair dryer. The towels get changed every 2-3 days. They have secured parking, which is perfect. The BILLA supermarket is 300 m from the building and the “cukrarna” below Angelato sells some great ice-cream and coffee! Very big and clean appartment. The tram stop is just near the building and it takes just 15 min maximum to get to the center. 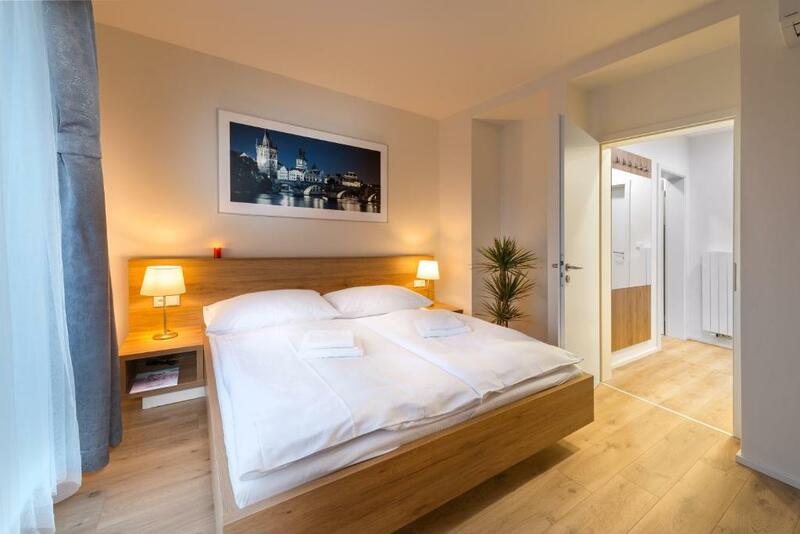 Lock in a great price for DownTown Suites Belohorska – rated 9.2 by recent guests! DownTown Suites Belohorska This rating is a reflection of how the property compares to the industry standard when it comes to price, facilities and services available. It's based on a self-evaluation by the property. Use this rating to help choose your stay! 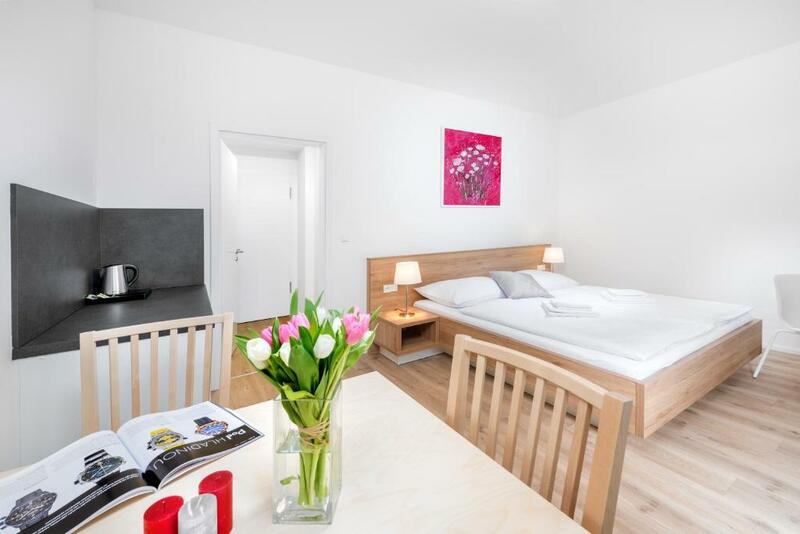 One of our top picks in Prague.Located in Prague, within 1.1 mi of St. Vitus Cathedral and 1.2 mi of Prague Castle, DownTown Suites Belohorska offers accommodations with free WiFi. Guests will receive a voucher for breakfast at a nearby cafè. All self-catered units feature parquet floors and are fitted with a flat-screen TV, an equipped kitchen with a fridge, and a private bathroom with shower. Some units include a dining area and/or a terrace. A continental, à la carte or Full English/Irish breakfast is available daily at the property. Charles Bridge is 1.6 mi from the apartment. When would you like to stay at DownTown Suites Belohorska? 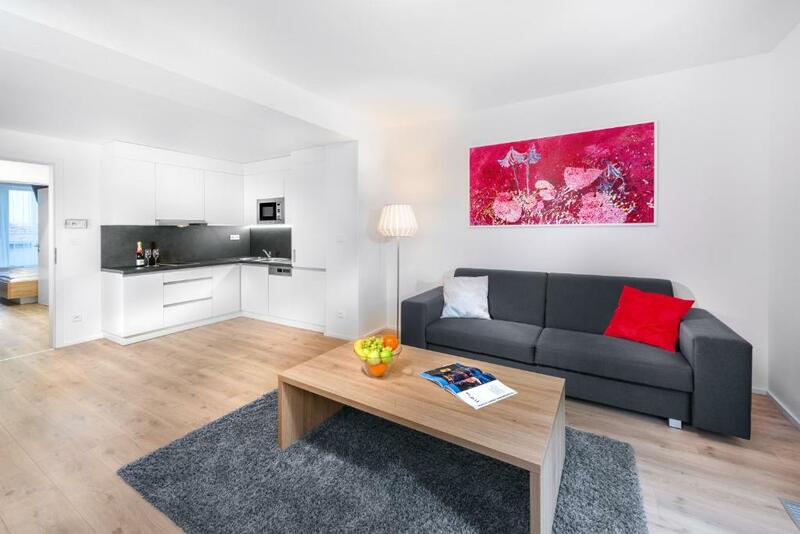 This apartment has a sofa, air conditioning and microwave. This studio has a kitchenware, tea/coffee maker and satellite TV. This apartment features a tea/coffee maker, sofa and balcony. This studio features a stovetop, view and kitchenware. 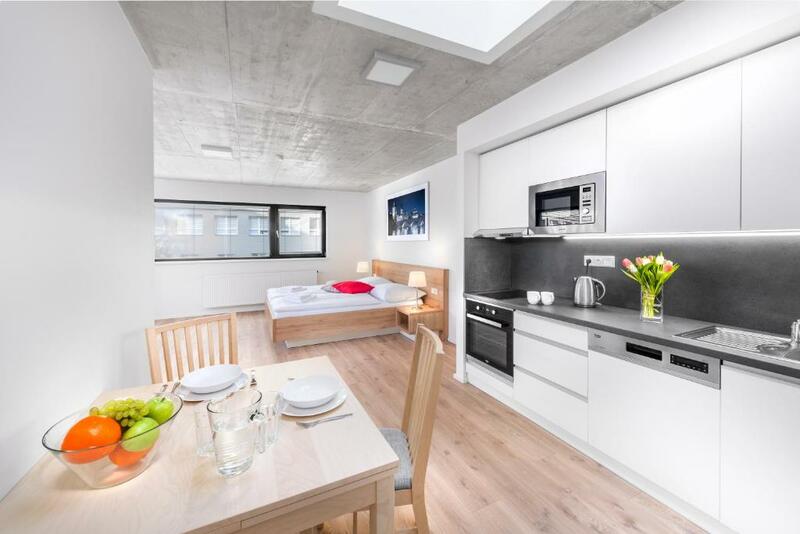 This apartment has a kitchen, soundproofing and stovetop. 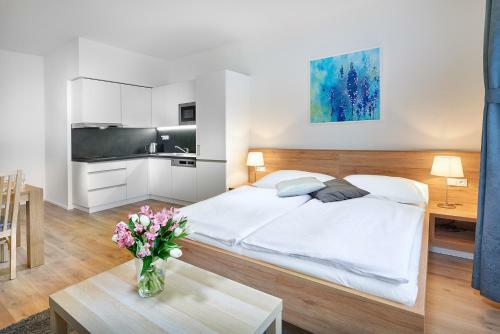 DownTown Suites Bělohorská offers 18 newly refurbished apartments within 5 minutes walking distance from Prague Castle, ranging from Deluxe Double Room, Loft Apartment , Superior studio to 1-Bedroom Balcony apartments (up to 5 people). 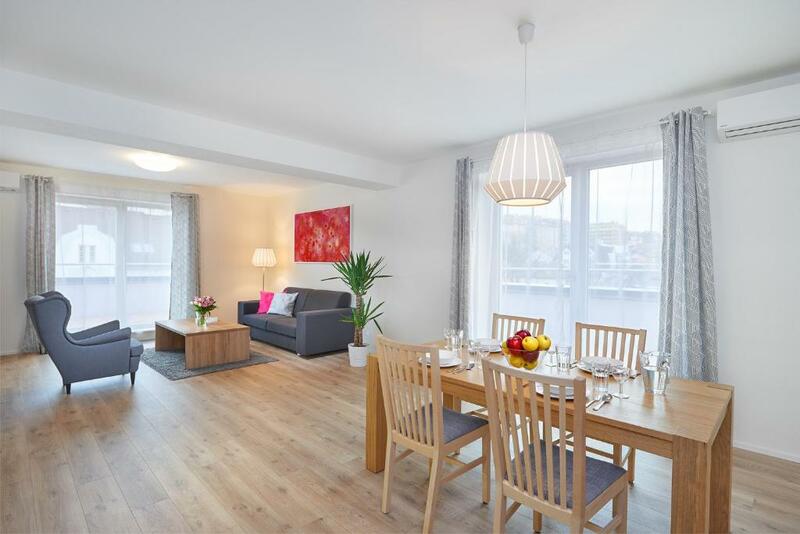 We also offer two Penthouses with terraces and beautiful views on Prague. We are well established serviced apartment operater with almost 50 apartments in Prague. Recently renovated apartments just beyond the Prague Castle. Our brand new Residence combines quality lodging in a pleasant district with easy access to downtown (5 minutes by tram no. 22) and the airport. The area is ideal for active healthy lifestyles, offering quality food and dining, sports and wellness facilities. Your strolls through the neighborhood will take you to historic monuments and extensive public parks. House Rules DownTown Suites Belohorska takes special requests – add in the next step! DownTown Suites Belohorska accepts these cards and reserves the right to temporarily hold an amount prior to arrival. Please note that reception is open from 8:00 to 12:00. Guests will be required to use the secure code which will be sent by e-mail before arrival. In case of payment by the credit card at the hotel, the total amount will be charged according to the actual hotel exchange rate. From the parking it's could be better if we could access lift through without any step. Traveling with big lugage is a bit unconvinient. Loud noise from the main street- unable to sleep with windows open. I would prefer faster elevator but that's just for a note. When we got into our room the windows were open and it was cold there. Nothing else, apartments were perfect. Apartments exceeded our expectation. Big flat TV, large bed, fridge, soap and shampoo in the room. For that much comfort it's very affordable. Rooms are modern not old fashioned. Nothing really. Only minor gripe would be that view outside of my window was a little better, but that wasn't a deal breaker at all. I had an excellent stay at Downtown Suites Belohorska. It's located in a nice area that is close to Prague Castle and about 10 minutes away from Old Town. Also, the staff were friendly, check-in was easy, and the room was pristine as well as clean. Would definitely consider this place the next time I take a trip to Prague. Pillows were uncomfortable . And the room has not had any landline in the room to call reception .. Person at the reception was so sweet and helpful. The room itself is cosy and clean, also has things like a hairdryer. The building had laundry facilities and there was laundry power etc to use all for free.